"Being curious is sometimes very rewarding. No wonder scientists become instant celebrities when they discover something out of their curious brains." There are actually a lot of ancestral and old houses in almost every town in the Philippines but we fail to appreciate them. We are so much preoccupied with seeing the famous destinations within that place leaving the simple things ignored and left unseen. 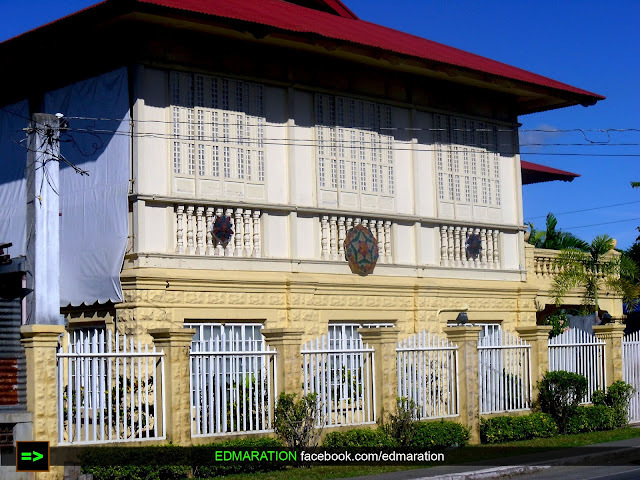 As usual, after seeing the must-see tourist spots in Batac City, it is my mission again to highlight the less appreciated things and ignored places in Batac City and these include some ancestral houses. 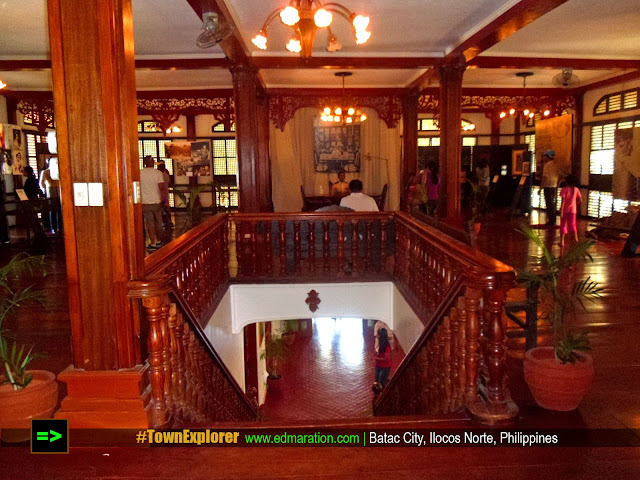 There are no plenty of ancestral houses in Batac so don't expect to go in this city looking after them. There are only a few old houses located within the city and the fact that they are not all evident, they are left ignored and both tourists and travelers fail to appreciate them. For a regular tourist with the only goal of getting a delight from touring the attractive spots of a place, I believe they won't care about appreciating the old or ancestral houses they see on the road. Some might say, "So what about that house? It is just an old house." I will totally agree if an ordinary tourist will say that "I won't spend my money just seeing those houses." because they can be right. Seeing just only a few old house isn't a delightful activity. But for advanced travelers and explorers, I believe that traveling is not all about fun. Traveling is a form of learning, discovering and appreciating even the simplest thing we see along the road. Personally, if I travel, I am not focused on the famous destinations, although I have also an itch to see them. But after seeing the must-see places, I really find time to explore more about the place and learn a new lesson in this new classroom. Traveling for me is a continuous learning and the places where we go is our classroom. So when I had the chance to be in Batac City, Ilocos Norte, some old houses caught my attention and they looked very charming before my appreciative eyes. 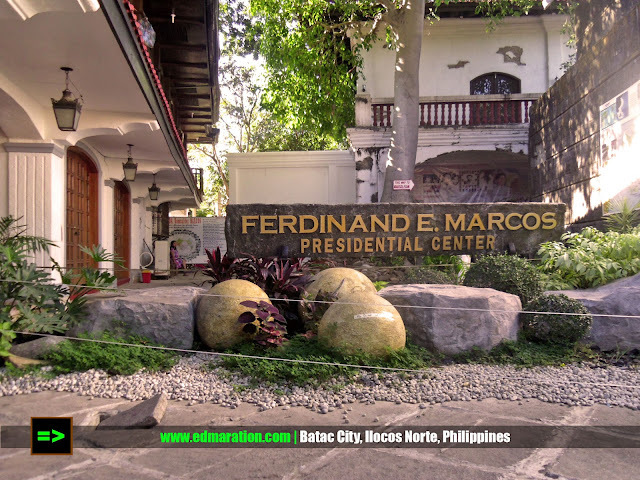 Well, in Batac City, the most famous ancestral house to see is probably the Ferdinand E. Marcos Presidential Center. Ferdinand Marcos is probably the most dynamic president in the Philippines which has done many projects in the country and governed the Philippines for more than 2 (two) decades. If you want to see the remains of Ferdinand Marcos, the late president of the Philippines, you can see it within this old house for an entrance fee of 50 pesos. I was able to explore what are the things to see in this old house and it will be featured in a separate post because of my bad habit of overdoing a single post with a lot of photos. 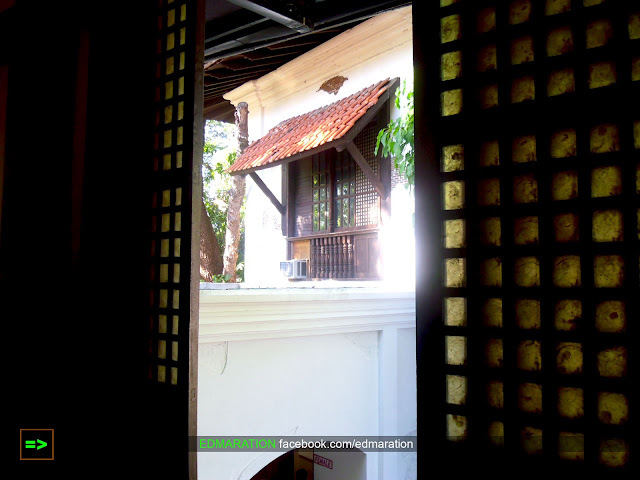 For now, I am sharing one photo taken inside the ancestral house overlooking another old house nearby from the capiz windows. 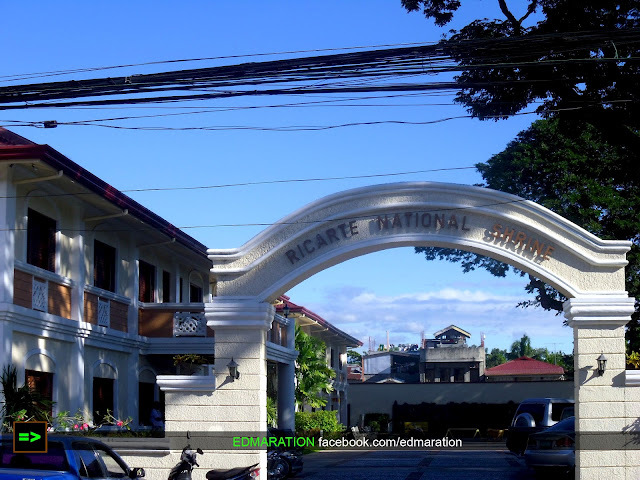 Another old-looking house I have seen is the General Ricarte National Shrine. 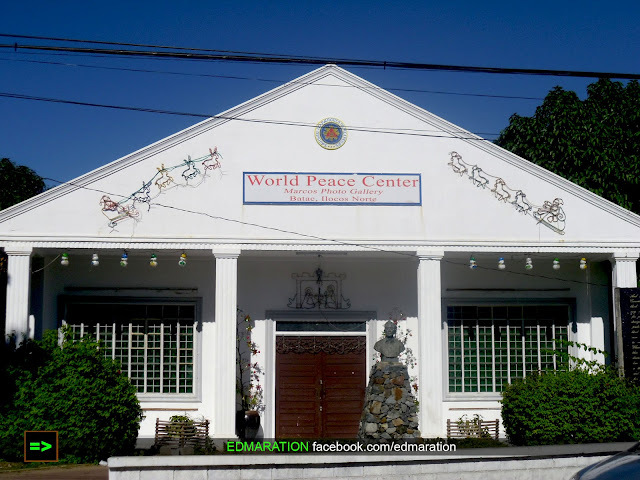 This shrine was built in Batac City in honor of the latter who is a native of this town. He has been known for being a revolutionary hero and a valuable personality in World War II with great importance. The shrine is composed of a memorial park with a statue and two field guns. 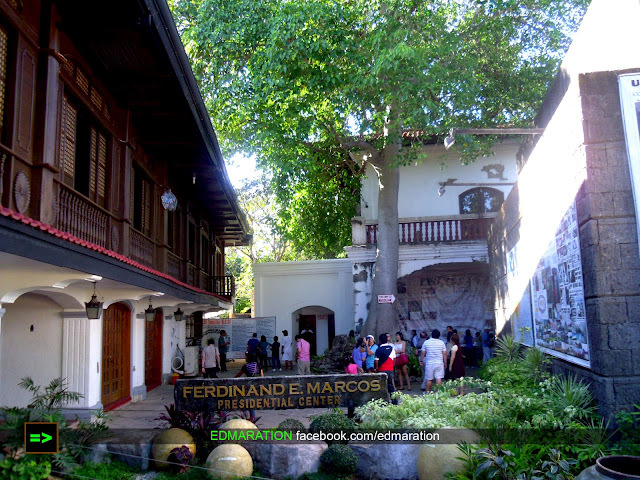 Within this old structure is a library and museum which showcases the life of Gen. Ricarte via a number of photographs and relics, and a collection of American and Japanese guns in WWII. 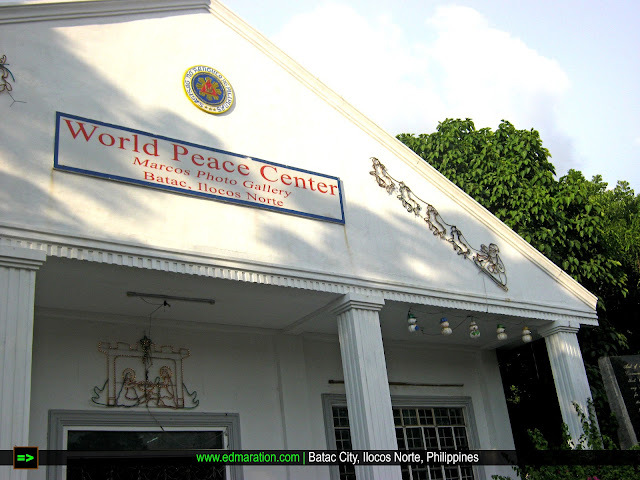 Speaking of photograph, I also discovered the World Peace Center, a structure that houses a photo gallery of the former Philippine president Marcos. It was closed when I got here so I wasn't able to see what's inside this structure (as of this writing). It is noteworthy that for the old houses that we usually ignore and don't care to see at all are in fact full of stories and history. If I did not personally intend to visit old houses and ancestral houses in Batac City, I won't discover the things I am sharing to you right now. If I have ignored them, I might not learn new interesting facts and lessons. Truly, traveling is also learning. And yes, it wasn't fun walking the city with aching feet and hungry tummy for the sake of looking for this old-looking houses and structures but as I have said, traveling is not purely for fun, it is also a learning process. I did not expect that visiting these houses into a closer scale, my efforts are having a value. Being ignored and left unseen, that would be a traveler's lost for they did not make the most of their time discovering the place. Ok what else? 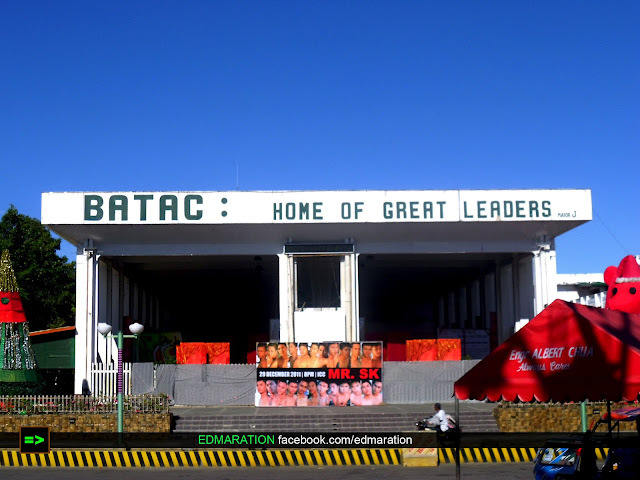 As I am doing a walking tour in the city, I read something, "Batac: Home of Great Leaders." To tell you the truth, I really didn't expect to know that the old houses I was looking after were the houses attached to the lives of our great leaders in the country. What I just wanted is to appreciate these old houses and as I promised to myself, to just blog about the ignored things in a place but for this goal, it was more than rewarding to really learn the importance of the houses I have visited. Being curious is sometimes very rewarding. No wonder scientists become instant celebrities when they discover something out of their curious brains. Without exploring the old houses, I may have not understood why the caption tells that Batac is the Home of Great Leaders. I have learned that we should not underestimate any place we see, any person we meet, any single simple house we encounter and who might know, the answer to your questions is actually there. 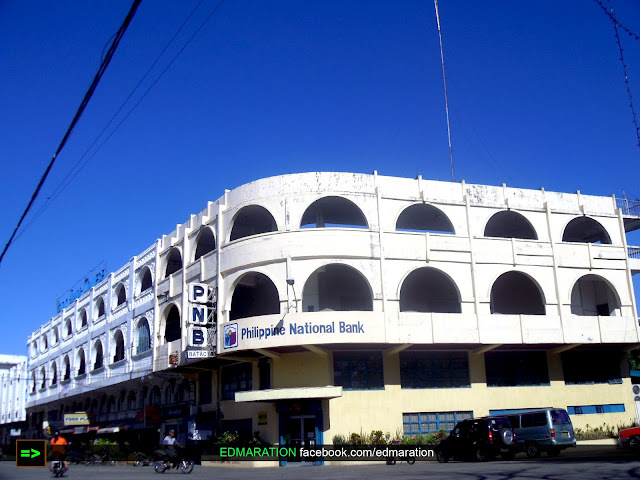 Discovering more about Batac, this building is probably the most iconic structure there because its design is more like to be a building in a European Medieval city. Well, it is how I looked at it. Another 112 on 2012 exploration and I am loving this craft. I realized I am such a stupid traveler that I really have to learn new lessons. Well, life is an unending school.The best lesson I learned in this trip is "Never underestimate even the ugliest scene you see in a place until you know the real value of it." Yes, you should have dropped by, sayang. Batac is also where the body of Marcos is located being displayed inside the Masoleum and open for public. Di ba ayaw siyang ilibing sa libingan ng ga bayani? hehe. Very beautiful! One can really feel the Spanish influence. I hope they get preserved even longer. Nice photos! 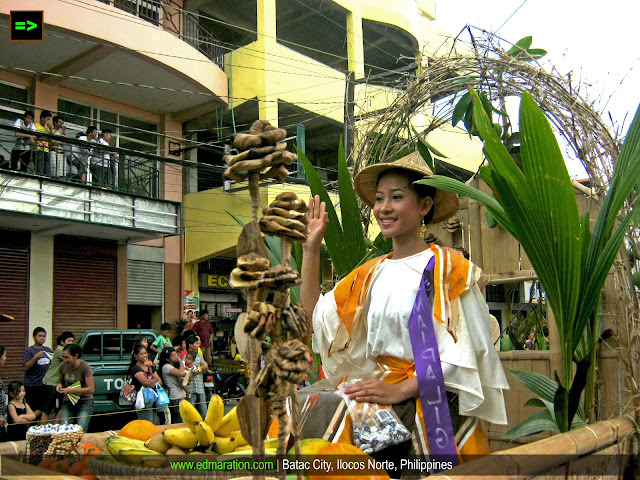 It's definitely more fun in the Philippines! Yeah. There are only a few houses remaining so there really is an urgency to preserve these houses before everything is gone here in Batac. Hope they will really preserve these houses in a long term basis because there are only a few remaining in Batac. I really hope the local government will preserve these old houses, sige kayo pag pinabayaan nyo yan bibilhin ni Jerry Acuzar yan at ilalagay sa resort nya sa Bataan.LOL. Very nice, looking forward in the near future visiting this place. Well they have rich historical significance because the late President Ferdinand Marcos was from here, and the photos of those old houses are equally important to Filipino culture and heritage. I hope the local government would preserve those structures because they are simple mirrors of our past. You're absolutely right that these houses should never be underestimated. It is a good side-trip. But don't make it your main travel focus LOL. wow ang ganda! i love old houses, kaso bakit yung iba parang newly painted?? sana maintain lang nila but they should not alter it.. They were newly painted because of renovation and restoration. "Traveling is a form of learning, discovering and appreciating even the simplest thing we see along the road" - This is so true. I also make it a point to see the famous landmarks first when I arrive at my destination, but I don't stop there. Otherwise, you won't see things past what fellow tourists see. Now I see how Batac looks like. very genteel and calm ang mga photos mo sa city of great leaders. I wanna see the city soon. I a so glad that you agree with my ideas and can relate with the things I am talking here LOL! Tama Doc, it is just a simple small city. It is not stressful doing a city walking tour here. 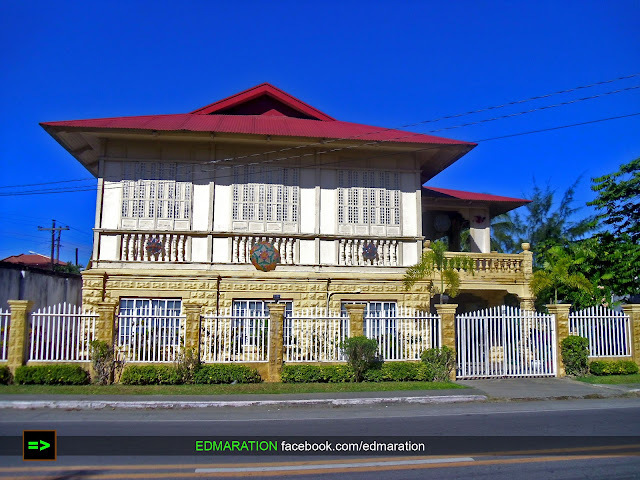 The ancestral houses in Batac is really worth exploring. I went to Batac way back in 2009 together with my classmate and her family. We saw the body of the former president - Ferdinand Marcos. We also bought chichacorn near the church. Wow, great find! One of the houses I mentioned here houses the body of Marcos. I want our architects to dig through the ancient building designs and not bother with modern style. However, ancestral homes and elegant buildings are quite hard to find today. Pinoys always fail to conserve something that is the foundation of their cores because they bother so much with what is new and trendy. Curiosity leads you to the unknown and edifies the known. I agree with you that we should never underestimate anything and conclude right away without first giving the benefit of exploring it. More power to explore places of interests! I really agree with you. Because now wants the trendy! However we can not blame them. But for old houses being renovated to fit the "trend," uh that's a crap! Thanks sir. There is really no room for underestimation especially if you are a hard-core, adventure-seeking traveler. 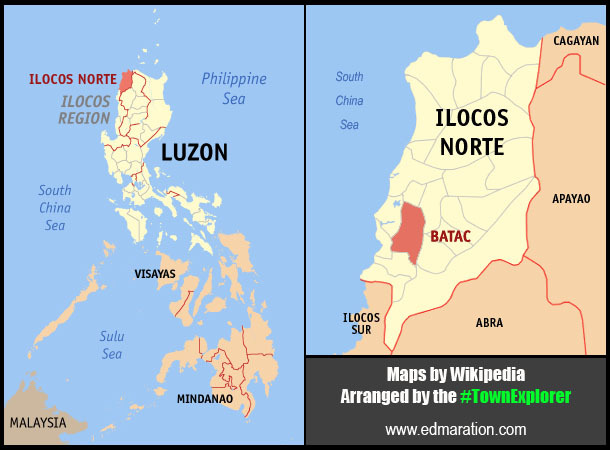 I have been in Ilocos before but wasn't able to go there. There are many old houses in Ilocos. Even Vigan brings you back in time. Aside from the structures, food is also great in Ilocos. Yep, there are really plenty of old houses in Ilocos. And if we talk about old houses, Vigan is the Queen. Couldn't agree with you more - that the best thing about traveling is the learning, not just the "fun". However, learning for me IS fun, so going to old ancestral houses is my definition of a good time. I enjoy learning about history right in the place where it happened. There's that palpable feeling of being part of the story, even just as a spectator from another time. So I would say that it's more fun to learn while traveling. 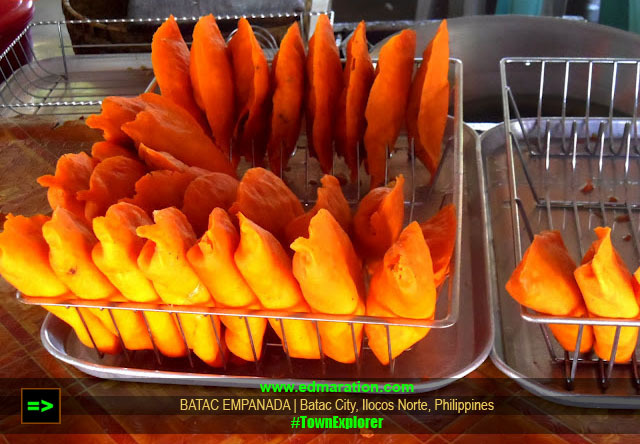 :) Thanks for sharing these off-the-beaten path sights in Batac. Same here, learning is fun and there are really a lot of things to explore (e.g. old houses, barangays, river, lakes, buildings, museums, etc) only if we love to learn. Sadly, many ignore them. im really amazed how they managed to maintain its classiness and beauty in spite of the ages.. my grandmother's house also have those Kapis window.. Such an inspiring post. I'll keep those in mind so that in the next travels that I will make, I'll explore beyond the huge names and go even to the least there can be,so that by doing so I'll learn what there has to be learned and discover what there has to be discovered. Ilocus Norte - old houses, old town and truly a cultural heritage. Great post! True, in fact one of the best destinations are those which are underhyped, and they give surprises. batac is indeed rich in history . 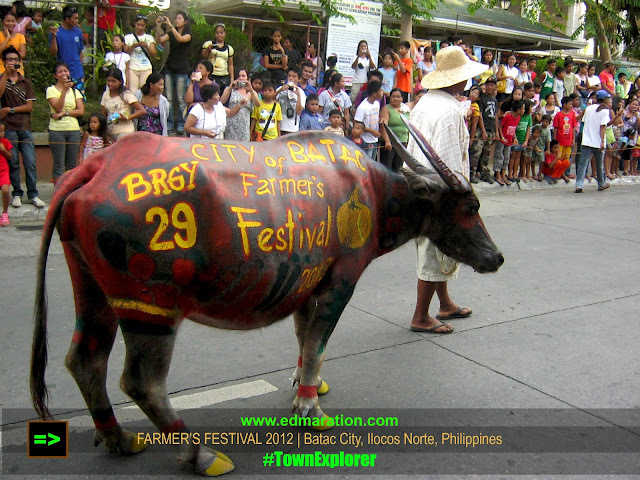 Now i miss batac ilocos norte. "There are actually a lot of ancestral and old houses in almost every town in the Philippines but we fail to appreciate them. We are so much preoccupied with seeing the famous destinations within that place leaving the simple things ignored and left unseen." That's why its so depressing sometimes to visit a place and there are beautiful old houses but the locals themselves fail to appreciate these structures. If they know how to value and know the tourism potentials of old houses, preservation will not be far behind. Oo nga po. Sometimes if you look after these old houses and be the subject of your photos ay parang weird ang tingin sa'yo ng mga kasama mo kasi it is not a "touristy" thing but they fail to understand the significance of them and the history veiled in those houses. The beauty of a single thing, especially old houses depends on the eyes of the beholder. I, personally,also don't want to ignore these old structures. They stood up there for the test of times. I also see old structures not only its facade but also the shadow of its importance and significance to the lives of the ones who restored and preserved it. The value of the property especially antique houses cannot be seen outwards, but there's more value inwards. I can equate this things on why antique paintings are valuable than those that just recently painted. I love this post. I can really feel the sincerity of the author on how he value old structures. Kuua Bonz, yup, once their gone, it will be forever, sayang kung mawala ang heritage natin. 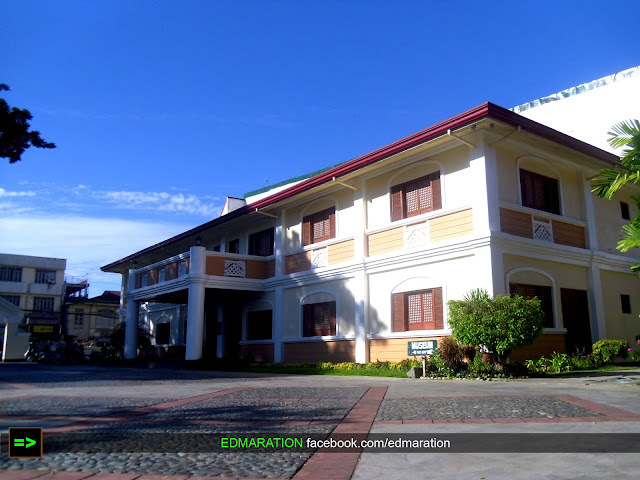 The first picture of an ancestral house u posted is the house of a Gobernadorcillo of Batac during the Spanish period. It is called bahay na bato. There is also another old house beside the Marcos Museum and infront of Aglipay Shrine. Thanks for this nice article. I am so proud of my hometown.